My team and I are often asked to comment on – or do a more formal evaluation of – a product or business concept prior to launch. This may be part of a new venture concept or a new product line in an established business. In either case, the basic question is: “Will we be successful in the marketplace?” Since we have been involved in about a dozen business startups and a couple of dozen new product launches, we are certainly familiar with the promises and pitfalls of launching new products and ventures. Like you, we know that the go/no go decision is one of the toughest any of us make as business owners or corporate executives. Not only in terms of whether the product, team and financial model are workable, but also whether the objectives can be achieved from a marketing and sales perspective. My perspective is that it is much better to find this out quickly, at low cost, than engage in a long and costly research, business plan creation, fundraising, and launch process. Instead, I advise practicing the lean, iterative business model, with a mantra of “test, fail, test, succeed, scale” (in that order, please!). 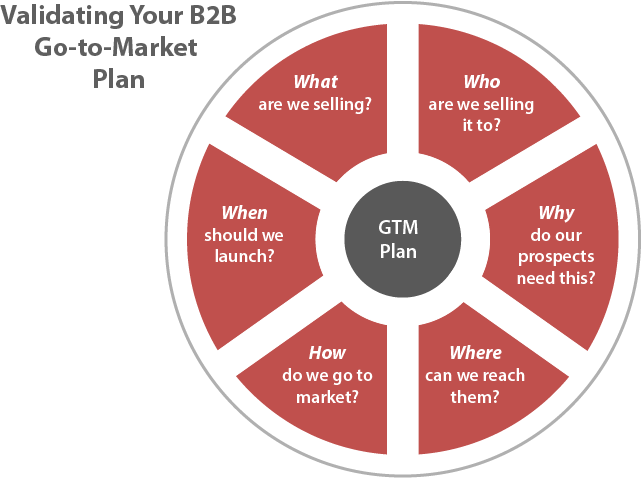 So what exactly are we trying to validate in the go-to-market plan? Let’s apply the “who, what, when, where, why and how” formula, sequence to determine this. These are the questions you and your launch team should be asking, and the information you will want to gather before scaling your business. And if the answers don’t validate your current go-to-market strategy, you use them to revise the plan or possibly forego an ill-fated launch altogether. Who are we selling it to? At this stage, we do persona mapping — determining the demographics and psychographics (personal and business) of who we think will purchase our product or service. Remember that who you think will purchase and who actually purchases may be quite different, so it is important to test this in the early stages of the launch. Why do our prospects need this? Given all the ways our prospects can spend their money (or not spend it), why is our offering something that will grab their mind share and wallet share? What are the compelling factors that will make them overcome inertia and hit the “buy now” button or engage with a sales representative? Where can we reach them? This is where you determine where your prospects hang out, what they read and who they listen to, and also where you discover which media are the best at reaching people who may not currently know who you are or why they may need you. How do we go to market? I’ve written a lot about marketing and sales models, including this recent post where I discussed sales models as a core component of marketing and sales alignment. There are four major types of B2B models, including direct, telesales, channel and online, with dozens of hybrids and variations. There are ways to test these models at very low cost, with the goal of achieving a consistent and repeatable go-to-market model as you scale the business. When should we launch? Okay, to confess, the “when” isn’t as important as who, what, when, where, why and how, but I needed it to complete the set. Actually, “when” can be important when you consider the impact of seasonal purchasing and competitive product launches. Enough said about this. Marketing research does have its place in your go-to-market plan validation, but usually as a form of pre-testing. Conducting research online or at the library — or asking someone whether they would buy a product at a focus group – is not the same as proving whether there is a market for your product. Better to spend some time and a few dollars on the type of testing that really counts – whether your prospects will actually purchase of what you are selling. That’s the type of testing that gets me excited!